If you have any questions or want to enquire about dates, use our form to contact Helen Mercer or see their website for more information. 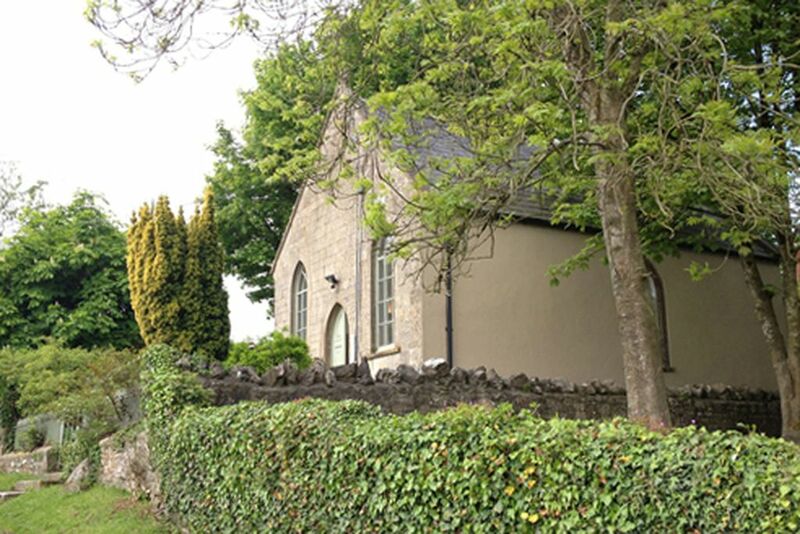 Through the village of Downhead, up the lane, and there it is: a charming old chapel built in 1863. There’s gravel at the front, seating space to the side – almost a walled garden feel; with just a couple of neighbours, you’re nicely private. Walk through the dreamy green door and lofty, airy living space opens up before you, with stripped floors and contemporary pieces, half-shutters diffusing light from arched chapel windows, and black and white portraits on pristine white walls: Lord Bath in one corner, Damien Hirst in another, an intriguing private collection. A grand piano sits to the left of the space, a green chaise longue flanks a wall and there’s a glass bottle chandelier designed by Kevin McCloud: you’re in good company. The kitchen is ready for budding chefs, the sleek bathroom is warm underfoot, and the bedroom is up on the mezzanine. Close by is Frome, historic market town popular with London escapees, while Longleat trumpets the grandest example of Elizabethan architecture in Britain – plus lions. Come home to sumptuous bubbles to soak in, silk robes to pad about in, and space, comfort and peace. Minimum stay: 3 nights. 3 nights on weekdays. 3 nights at weekends. 3 nights in high season. Pets by arrangement. A delightful and peaceful place to stay. The under floor heating and grand piano make it great place to come back to after a day out, or to hunker down when the weather is wild. I spent a beautiful weekend at Chapel Studio. I had been looking for somewhere quiet to have a retreat, where I could play the piano, do some composing and enjoy some walking. The Studio is a tranquil, inspiring space, and designed simply and elegantly. Helen provided an excellent service, providing useful information about the house and local area. Fresh eggs and a chocolate brownie on arrival was a lovely and much appreciated touch. I am already hoping to make a return visit - possibly for another piano retreat, or perhaps for a romantic weekend with my husband. Just spent a blissful long weekend at the Chapel. We loved the style and atmosphere created by its very helpful owners and the facilities are all excellent (the bed is very comfortable!). The Chapel is well situated for sightseeing around Somerset - Frome and the Hauser and Wirth gallery in Bruton are must see places. We Have just spent a wonderful week in this lovely Chapel. It is surrounded by the most beautiful countryside with a pretty peaceful garden to sit and relax in. The Chapel just wraps itself around you as soon as you open it’s door and step inside. It is just so welcoming and homely. Immaculately clean with every facility you need. Graham loved the Piano which he played everyday and hated leaving. Just the most perfect holiday. We were lucky enough to spend 3 nights in the Chapel Studio, thanks to Helen. This is a completely charmed dwelling, with absolutely everything you might need, including a grand piano! I brought books, my violin, food to cook, and then hardly had to leave. There are great walks nearby, but this is an ideal place to hunker down when the weather is bad as the property has been exquisitely furnished with no detail left out! Underfloor heating, great shower, comfortable bed with quality linens. I am looking for an opportunity to come back soon! Beautifully presented property, with all the amenities that you could wish for, at a high standard. Convenient for places to visit in and around Somerset whether that be visiting Bath, Salisbury or even Stonehenge; you'll be spoilt for things to do! Then upon your return, settle back down into the comfy sofa or entertain yourself with a tickle on the ivories. Your host can also provide the services of a chef, if you don't feel like cooking - so remember to ask. The food was delicious! If you are looking for a really special place, then Chapel Studio definitely ticks all of the boxes. An absolute gem. All of the home comforts encapsulated in an inspirational space. You will be torn between going out to the beautiful countryside, stunning towns and cities and truly great nearby eateries or just visiting the deli and wine merchant and staying in. It more than met our expectations and the owners have put a lot of thought and effort into making it a destination you will want to return too. We will look forward to our next trip there. The Chapel is a charming little book from which to explore Somerset. It's tastefully decorated, and feels a lot more spacious that it look from the outside and it had everything we needed. After a day of sightseeing, it was a lovely haven to come back to and relax. Helen was a tremendous host and even went he extra mile in getting us gluten-free products in the we me basket. It's a real gem! What a find! Idyllic location, which was within easy reach of plenty to see and do. The chapel was beautifully decorated with great facilities and lots of added extras to make you feel at home - particularly liked the chocolate brownie in the welcome hamper and the fresh flowers. Helen and Tim were an absolute pleasure to deal with. All in all, a fantastic holiday - we will definitely be back! Believe the photos, this place is as good as it looks. You feel at home right away and the welcome pack left by Helen is, well, most welcome! You will feel splendidly isolated yet are so conveniently situated for so many great days out - Bath, Wells, Sourhead, Stone Henge and Cheddar George to name but a few. This property was recommended to us and we pass on that recommendation without hesitation. The studio is comfortable and well-equipped - a great place to come back to after a day exploring the area, We made good use of the OS map provided to discover walks in the immediate locality. In particular we'd recommend walking via Asham Wood and the East Mendip Way to the excellent restaurant at The Grange in Whatley. We also enjoyed a stretch of the Leland Trail, starting at Redlynch and ending up in the grounds of Stourhead. What a beautiful cottage, very aesthetically pleasing and tasteful, keeping the feel of the original chapel. We loved the bathroom, huge bath and very hot water and it's the first time we've slept on a mezzanine floor, it's gorgeous with a huge bed and sumptuous bedding. We actually unexpectedly cooked each evening as it was very cosy and we were happy to relax and stay put in the hideaway. We definitely visit again, Bath and Frome are lovely, we just ran out of time when work beckoned once more! Highly recommend it, nice welcome package too, thank you. This is a stunning apartment. The photography of the chapel creates high expectations that are exceeded in reality- its comfortable, well equipped and stylishly decorated. We had a long weekend to celebrate our wedding anniversary and my 50th. We hardly left the chapel as it was so relaxing, but when we did we enjoyed some walks and meals out in some really nice pubs. The welcome basket of goodies - plus nice touches like quality toiletries are really welcome. My only regret is that neither of us play the piano as the chapel has its own grand! We will be back. Near Frome with interesting artisan shops. The Independent Supermarket on the first Sunday of each month which fills the town with stalls of local food, designer & makers goods and a flea market. Also home to the two week Frome Festival in July. Easy Access to the beautiful Bath city with its stunning architecture and Thermae Bath spa, also to Bristol, and the City of Wells. Close to lovely walking countryside on the Mendips and the sustrans cycle route. Situated in a quiet hamlet away from the hustle and bustle of everyday life. Close to Frome - home to the wonderful summer music festival in July and the monthly artisan markets. And Bruton with At The Chapel Restaurant and Hauser & Wirth gallery, Roth Bar grill and gorgeous gardens by Piet Oudolf.